Just reading this post , reminding us that 26 long years have already passed since that fateful chaf zayin Adar, brings forth tremendous emotion and pain – as who could believe that we are still here today, with the complete revelation of the geulah shleima nary in sight!!! 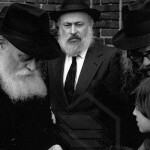 Yet in truth, there is something major that the Rebbe had clearly stated in his last sichos is the final avodah that will bring about the geulah shleima – yet it shocks 26 years later, when I point this out to people, they are totally shocked to see it in black and white, yet nobody knows about this!!! What avoda am I talking about that has not been done – or rather, has barely been done, as I am already actively teaching this avoda to N’shei Chabad around the universe – one neshama at a time – and now I recognise that it’s time to share this with every single Jewish woman in the universe – not just those that I have been zoche to come in contact with and teach them the ropes. The Avoda of the embodiment of the deeper truth of Malchus for all Nshei Ubnos Yisroel – which the Rebbe refers to in the Yud Shvat sicha Shabbas Parshas Bo, Vav Shvat, and Beshalach Yud Gimmel Shvat , Taf Shin Nun Beis!!! So the Rebbe is telling us that there is something that the woman have which gives them superiority over the masculine, which is why the women must learn Toras Chassidus in our generation, more than the men! Because it’s what were going to uncover, through our learning , that will reveal what exactly we need to do to bring about the geulah, b’poel mamash! Again, here the Rebbe is telling us that there is something about the redemption process itself – the revelation of the superiority of malchus, the feminine dimension – that is going to be part of the redemption process itself! In other words, when the truth about malchus is revealed and put into practice, that itself is the redemption process!!! Further on, the Rebbe explains what that truth is – “…..And thus, according to the content of Basi Legani, where it says that Hashem is inviting us to His garden…the whole purpose of creation is to make a home for G-d here in the lowest realms, through the efforts of the Congregation of Israel. …And in this task, we find superiority of the women, just as it was with our Imahos, Matriarchs; it was specifically our Matriarchs who had the power to refine (clarify) the worldly matters more than the Patriarchs, whose main avoda/service was of otherworldly matters, for women are more involved in the (physicality) of the world. Footnote 31 – the reason for this is that the root of the Matriarchs is higher than the Patriarchs, in the way of “the end of the deed begins with the original thought”, as will be revealed in the future, that the “feminine will encompass the masculine”, and “ a woman of valor is the crown of her husband”. Here the Rebbe is telling us clearly that in truth gashmius is higher than ruchnius (lights of tohu higher than the lights of tikkun), therefore, because women are more connected to gashmius than the men – that’s why they will be the ones who will be able to finalise the avoda of making this world a dirah b’tachtonim – because the tachtonim is the gashmius of the world! And lest anyone not be clear on the fact that the women taking gashmius to the next level (the revelation of the deeper truth of malchus) is the final piece needed to bring about the geulah shleima, the Rebbe said it quite loud and clear in the sicha of Chaf Beis Shvat Taf Shin Nun Beis!!! The Rebbe is saying here that the women have the koach more than the men to finalize the avoda of making this world a Dira B’tachtonim , for the final avoda requires revealing Atzmus, the highest level of Hashem! Atzmus is the level of the Oneness of Hashem, Hashem before creation, when there was no separation between upper and lower, ruchnius and gashmius etc. Atzmus is found in the gashmius, rather than the ruchnius. Being that Chazal use the lashon of “Dirah B’tachtonim”, it is understood that we need to recognize the comparison to a person’s home in the physical world which evolved from this inyan of dwelling place from above. 1. The dwelling is nullified completely to the person that lives there. Meaning that all the details of the home serve him well, and in all the details, the whole existence of the one that dwells in it is expressed. 2. The beautiful Dirah gives harchavas Hada’as to the person. The completion of the Dirah B’tachtonim is davka when it is a Dirah Naeh –a beautiful home, with beautiful furnishings, which allows for the Yid to conduct himself in a pleasant way (and like is befitting Knesses Yisrael, an Isha Naeh). Here the Rebbe is saying that Harchava B’gashmius is the ultimate goal in completing the avoda of Dirah B’tachtonim, because it gives Harchavas Hada’as! Like it says, to add to this, that when we make from the lowest world a dwelling for Hashem, according to the proper way, it needs to be beautiful, for according to halacha,”Everything that is “Lshem Hakel Hatov” should be from the pleasant and the good; so if one builds a shul, it should be even nicer than his house. Because “Ze Keili V’anvehu -This is my G-d and I will adorn Him”.. , we make our mitzvoth beautiful before Hasehm, ie. we , make a beautiful sukkah, have a beautiful esrog etc., and through this, it is understood that this mandate includes all the work of making this world a dwelling place for Hashem, for everything (not only mitzvoth) has to be in the way of a “beautiful home”. Everything has to be beautiful and pleasant (b’gashmius ) and thiusis not only connected with the completion of the tachton, but it affects the Harchavas Hada’as of Adam Elyon Kaviyachol!! And then the the Rebbe takes it further, in stating that not only when we have harchavas hada’s, do we finalise the avoda of dirah b’tachtonim, but even more than that, our harchavas hada’as b’gashmius affects the Harchavas Hada’as of Adam Elyon, Kaviyachol!!! Ois Yud Gimmel. This is explained as follows: The completion of the unification of 10 and 11 which is done through our deeds and work – purifying our thought speech and action in completion, brings the revelation of chaf besi shvat, which demands investing in new avoda that has never been done before!! !….and therefore, it will bring the geualah amitis v’shashleima! Here is a clear source that the Rebbitzens Histalkus brought forth the new Avoda that the women will do ,which will finally bring the world to completion! And please note, it says New avoda. So it can’t be that women bring geulah simpy through cooking and cleaning – this is something we’ve done for thousands of years, while the Rebbe says that it is something new that we will do! ….when there will be the completion of the concept Dirah Lo Yisborech in the physical world -the revelation of infinite light in this gashmiushdike world – when 10 and 11 become unified as one (level of revealing atzmus), is dependent on this avoda being done for the duration of the length of galus! Here the Rebbe is saying that the completion of the Avoda to make this world a Dirah B’tachtonim requires revealing the Atzmus of Hashem, which is in the gashmius, not ruchnius. And the chiddush here is that the avoda of revealing the Atzmus is to be done while we are still in galus!!! As stated above, when we have physical pleasure down here, it fulfills , kaviyachol, the ta’avah for pleasure in Atzmus itself!!!! And the chiddush here is that …. (besides for ) the renewal in the realm of the created , (where the) main avoda is in transforming the gashmius in the lower world so they could be proper keilim to reveal Elokus (thus revealing the hidden light of Hashem in them), for example, making teffilin from physical Klaff, and tzitzis from physical wool etc….the new avoda is that we need to take it further, and build a beautiful home have beautiful furnishings etc., for these things give harchavas hada’as to a person, as explained above!!!! Note, the Rebbe is clearly saying here that the new avoda requires that we take the inyan of using gashmius, to the next level!!! Its not enough to use gashmius for mitzvoth, now we need to use it for harchavas hada’as bgashmi!!! Ois Yud Daled :Through this , we can understand that relevance between what was said above and the Nshei Ubnos Yisrael….Because we see that when it comes to the home …the main decor and beauty of the home and furnishings, whether in gashmius or ruchnius, is dependent on the woman, the Akeres Habayis. As is known, the concept of beauty and the talent to make it beautiful is specifically the realm of the woman. ( Isha Naeh, Kallah Naeh Vachasuda..Till, “Ein Isha Elah L‘Yofi) It begins with beauty in ruchniyus,and from there evolves beauty in gashmius”!!! Here the Rebbe is clearly telling us that is because the women are most invested in the gashmiusdike decor and beauty of their homes etc. for their essence is more connected to beauty and pleasure etc., that’s why it is that they will be the ones to do the final work in bringing about the geulah shleima! It begins with them working on being beautiful b’ruchnius (beautiful middos? ), and the outcome is that it evolves to their avoda in beauty b’gashmius!! And we could say here that this avoda evolved from the avoda of the making this world a dirah b’tachtonim, and (now this aspect) of the avoda of beautiful home and beautiful furnishings is greatly dependant on Nshei Ubnos Yisrael! Footnote 96 – through this we derive the connection between …..“Ishah Naeh” and Dira Naeh , and Keilim Naim” – the three things that broaden the mind of man, because through a woman, that her inyan in Naeh”, there comes forth a beautiful home and furnishings. …And this is meramez (hinted) in the name Chaya Mushkah – which is about chayus and the smell of b’samim. As in order for it to be a pleasant home, there has to be Chayus in the home – a leibedike shtub. And even more than that , there should sensed the scent of spices – a good and pleasant smell., whether in ruchnius or in gashmius – because it adds more to the pleasantness of the home… And this is more sensed on Shabbos, because the inyan of Shabbos is Oneg Shabbos. …so accordingly, we could say that the addition of Chaf Beis Shvat is that through making a dirah na’eh – a beautiful home which is marchiv that da’as of a person which makes it even more emphasized the oneness of the 10 and 11 – Atzmus, so that the dirah in the tachtonim creates and renews a renewed harchava above, Kaviyachul. Here the Rebbe is again saying that the histalkus of the Rebbitzen brought forth the new avoda for women, the avoda of taking gashmius to the next level – and the chiddush here is that not only does harchava b’gashmius give harchavas hada’as to man and help him feel more geulahdik, so it is completing the work of dirah b’tachtonim, but it brings a renewed Harchava to the higher realms!! Our gashmiusdike pleasure affects the pleasure felt in the higher realms!! And from this we have the lesson for nshei ubnos Yiroel, and particularly the shluchos who gathered here from all corners of the world for the knus…– for although all of Bnei Yisroel have shlichus from Hashem to make for Him a dirah b’tachtoime, nonetheless, it is the Nsehi Ubnos Yisroel that have a exclusive shlichus to make a Dirah Naeh, with beautiful furnishings (b’gashmius ub’ruchnius)!!!! Amazing! The Rebbe is making it very clear here, in case the shluchos feel that they are excluded from this avoda, (perhaps they feel that there are other ways to focus on in bringing Moshiach? ), that it is particularly the shluchos that need to focus on this avoda – and of course, it is for all Nshei Ub’nos Yisrael as well!!! The ikaar is that in this time, the last moments befor the geulah, we need to arouse ourselves and all the women, about the great zechus of bringing the geulah amitis v’hashliem teikef umiyad mamash, that comes through the zechus of nashim tzidkaniyos of our generation (through the above, of making a dirah na’eh, isha na’eh etc.).!!! So in conclusion, the time is now to finally recognise that there is a very vital avoda that the Rebbe revealed to us 26 years ago, yet we have been asleep at the wheel! Barely anyone has paid attention to this!!! True, it’s not so simple, there is an art to revealing the Atzmus of Hashem in the gashmius – it’s not like we could just go splurging on gashmius and the geulah will come – far from it – and this art is precisely what I have uncovered 1 and a half years ago, and developed a course on the chassidus and practical application of this most essential and holy avoda that has been entrusted to Nshei Ubnos Chabad to bring about the final geulah shleima b’karov mamash. I have already launched global support groups for woman to help each other connect to this avoda and learn how to practically apply it to their daily lives – the next project is going to be the malchus miracles app, where everyone gets to share the miracles that come about due to doing this awesome avoda! 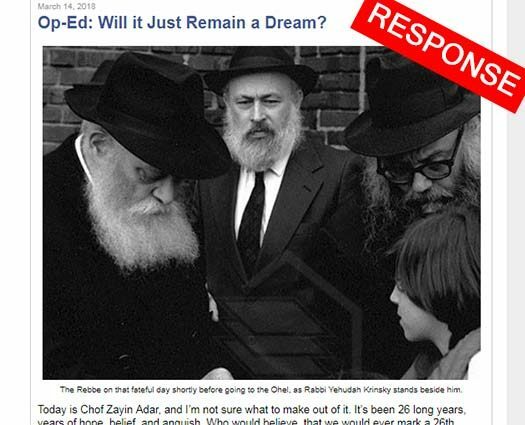 The Rebbe wanted an end to Yeshivas closing down for summer “vacation”, it’s high time we give the Rebbe what he wanted. Hundreds, if not thousands of our children will be saved! Summer “Vacation” kills our youth. Thank you for enabling women all around the world to do this vital avodah, that the Rebbe stressed prior to Gimmel Tammuz- in order to bring about the Geulah!!! The first stage of Geulah is freeing ourselves from the worldly issues, and focus our energy on making a beautiful world for Hashem to rest in! same here. this reads like a long ramble. See below. I will give it over in simpler terms BEH. Well there’s 10 minutes I’ll never get back! for 26 years women werent making a dira naeh with beautiful gashmius furnishings? ok i know i ddnt but i know plenty that did b’h b’h. My husband feels better, more harchovas hadaas with my stained stoves and cracked floors, old painted walls so i guess this doesnt apply to me. I am trying to say that I dont really understand what the avoda is- because it cannot be to go splurge and make a beautiful expensive furnished dwelling esp.if theres not enough money for tuition. and besides many did do it. Couldn’t you just simplify and condense your message? And I’m sure there are many who don’t understand a lot of your terminology, especially the Hebrew & Yiddish. I’m sure everything you said is worth noting, but if we are blinded by the language how can we follow? The Rebbe wanted us to leave the family planning for Hashem. This is mainly up to the akeres habayis, this is the bayis naeh, this is the isha naeh, and this is why the women of mitrayim were zoicheh to the geula, this is the priority!!! This is the dira betachtoinim this is atzmus Hashem, this comes before shlichus, before anything besides health related issues. Step on the gas!! hatslocho! I remember R Manis Friedman speaking with Reb Shalom about translating chassidus into English. This is certainly a great sicha that we all loved learning, at least I did. Now the article made the sicha available in English and we still don’t know what it’s talking about. If your course uses words like kaviyachol and reveal in it the message won’t come across as well as it could. Yes, I’ll be glad to explain the above in simpler, English terms. The above was intended to point out the direct sources , for those purists who would only believe that something so much the opposite of what we’ve always been focused on for thousands of years, is actually the final piece , ” a new type of service” , which will actually bring about the final redemption! This service is specifically connected to the women, again, it’s something they have not been doing prior, which is why the final redemption will be credited to the women. Stay tuned…to be continued. I’ll sum up the above asap. Actually, my course is very down to earth and practical, in fact, I don’t even quote the above sichos in the course, because I hadn’t even known about them prior to my writing the course. These above, verbatim sichos of the Rebbe only totally validate that which I had come to recognize from other sources, a year and a half ago. How many people laughed in my face when I told them about the ” new avoda- service”, since 1988. And here we have it in black and white, the Rebbe saying it’s a new avoda that has never been done before! And how many people told me that the revelation re the superiority of the Feminine dimension, which will be ” the thing” that will finally usher in the redemption, is something saved for after Moshiach comes! Well , here you have it in black and white! The Rebbe says that this service must be done while we are still in exile!!! Please be very careful before doing this avoda. It might be chasidishe terms but definitely not from chasidus. We need more of this in lubavitch! Brocha Lipszyc is one of the most inspirational women we have. Thank you! Now in short, to sum up the above: Many of us are familiar with the chassidus that tells us that when the truth about the Feminine dimension will be revealed, we will finally have true unification between husband and wife, and because whatever we, of the lowest dimension, do down here below affects the entire universe and the upper realms, it will cause the unification of G-d, the masculine, and the Jewish people, the feminine, finally ushering in the final redemption. But everyone always wondered, what is the truth of the Feminine dimension? It was always a mystery , and still remains a mystery to most- because they missed it when the Rebbe revealed it 26 years ago in the above sichos, and more. So the truth about the Feminine is that they are more connected to the physicality of the world- and it is specifically in the physical of the world where the Essence of G-d is found. 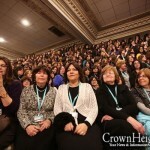 Now being that the final service to bring the redemption requires that we reveal the Essence of G-d – the highest level of G-d , that’s why it will be the women who will be credited with the redemption. Because in the above sichos, the Rebbe mandated that now it’s time for the woman to take physicality, the material of the world, to the next level, by revealing it’s G-dly purpose to the highest extent possible. The more that we can give a G-dly purpose to the materiality of the world , ie. self care, which is so essential to a woman being her highest self, the closer we hasten the redemption. And the reward of a mitzvah is a mitzvah, therefore, the more we do this service purposefully, the more abundance G-d bestows on us, so that we can reveal more of a G-dly purpose more materiality of the world. Until we draw down so much abundance beyond anything we have ever imagined. And this is the state of redemption that we always learned about, but never connected to! So no, we don’t go into debt to make a beautiful dwelling, there’s a whole build up that comes about through this mindful service. And what does this have to do with the unification of husband and wife? Because stepping into the Feminine dimension is an art, it’s multifaceted, and as elaborated on in my course, it connects husband and wife on levels unprecedented – building up to the deepest level of connection ever possible! you want to create a course based on your ideas and opinions, so you look for chassidus to back you up…. Still don’t get what you’re rambling on about. You’re not speaking in very clear terms. I’m still wondering what exactly this new “avoda” entails. Precisely! There’s lots of this going on in 770, main area of the women’s shul, where all afternoon, every day, there are women who quote the Rebbe’s sichos to prove their view, half a sentence from this sicha, out of context sentence from somewhere else, and voila, they have a new avoda .. Zara.! Very upsetting that this is going on. Even though The fight for Sh’Lemus Ha’Aretz seems overwhelming. We need to remember what it was like to fight for Yiddishkeit in the Former Soviet Union (the 2nd most powerful country in the world). And with the Rebbe’s brochos & guidance we won. & now the Soviet Union only exists in history books. i diSagree, you are coming up with a new form of service without any backinbg from rabbonim or mashpiim. i cannot trust this. Actually , I do have Rabbanim and mashpiim backing me. And no, I did not find chassidus to back up my theories. I saw the chassidus only, from all the Rabbeim, including our Rebbe, and recognized these same truths that the Rebbe Himself, in His own words, revealed in the above sichos – I saw it in other sichos. Hadn’t yet learned these, which are as loud and clear as you can get.You can see them for yourself in print! I give the exact sichos sources above. My wife took her course and as result of it we have more sholom bayis,more simcha,more hatzlacha in our shlichus (more children) and more yidden coming and learning about yiddishkeit! thank you Mrs Liphsitz!!!!!!! we both always tried our best in sholom bayis and it never worked until you came along!! dont get caught up with the language I am experiencing the results daily. I am happy to give my reference also. Before my wife took the course i asked a noted mashpia regarding the course and he said it’s totally chassidus and he constantly sends women to the course because he sees the results. If your kids are not in a HAPPY chassidishe home or you are lacking in sholom bayis YOU MUST TAKE INITIATIVE!! I can say that I learned myself how to behave and act as I saw my wife change. And one last thing, if I were to sum it up in one sentence, I’d say that the new avoda is for women to step into their malchus/feminine truths – a major part of it entailing intentionally utilising gashmius/material to the greatest extent possible, centered around Hashem, rather than as a mindless, empty pursuit. There’s an art to doing it right, which I teach. The miracles and beyond that have resulted from those doing this avoda are astounding! The proof is in the pudding! I couldn’t begin to disagree with you less. The lady’s job is to make her house beautiful not only for her husband but for Hashem. “Yesh Hanivro is the Yesh Amiti.” Hashem is everything and He chose our low world to dwell. Make Olam Hazeh beautiful again. Let Hashem feel this is where He wants to be. How do you do this? Join the course and find out. It probably teaches you to keep your house need and to choose the best furniture. But that the beauty should be consistent with Halacha and that the motivations should be pure. I hope this clarifies your message. 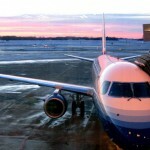 This article is very beautifully written and really strikes a chord. Your point about herchovos hadaas really connects with me, it reminds of my childhood when my parents where to poor to buy us orange juice to drink. Now however, when we have the capabilities to serve hashem begashmius b’harchava we should and we must. ALL THESE BLOGGERS WHO DRESS NOT TZNIUS AND WEAR PANTS AND DO NOT COVER THEIR HAIR, GO AROUND AND DO THIS ALL IN THE NAME OF CHABAD. THEY USE CHABAD AND CH TO GET FOLLOWERS. THEY SHOULD MOVE OUT AND NOT BE THE “CHABAD” BLOGGER AND SEE WHERE THEY END UP. G-d is the one deciding when Meshiach will come. Yearning for Moshiach is of such importance that according to the Talmud (Shabbat 31a), one of the very first questions a soul is asked when facing the Heavenly Court is: “Did you yearn for Moshiach? Yearning is called for. But say what wiil cause the Meshiach to come greatness is required.